I threw this together hoping it would work and it did, surprisingly! I usually split up a container of chicken breasts and bake it two different ways to make two meals. I did a honey mustard chicken with half and the other half I wanted to do something spicy for fajitas. We had left over onions and peppers so I cut all of them up. We also had some green verde salsa from Trader Joes and some random hot sauce. I threw everything into a casserole dish (with the chicken sliced in the center) and poured salsa and hot sauce generously over everything. It looked like a mess, but 20-25minutes later and only 1 dirty dish, I was sold! These are the kind of meals that I end up making again and again because we don't have a dishwasher in our apartment! :) This was so easy and delicious! I would have added some green peppers for a little more color, but I used what we had. Enjoy! 1. Slice 2-3 chicken breasts, lay in center of casserole dish. 2. 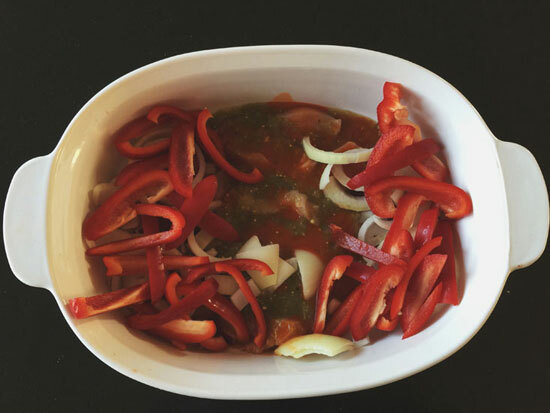 Thinly slice onions & peppers, surround chicken with veggies 3. 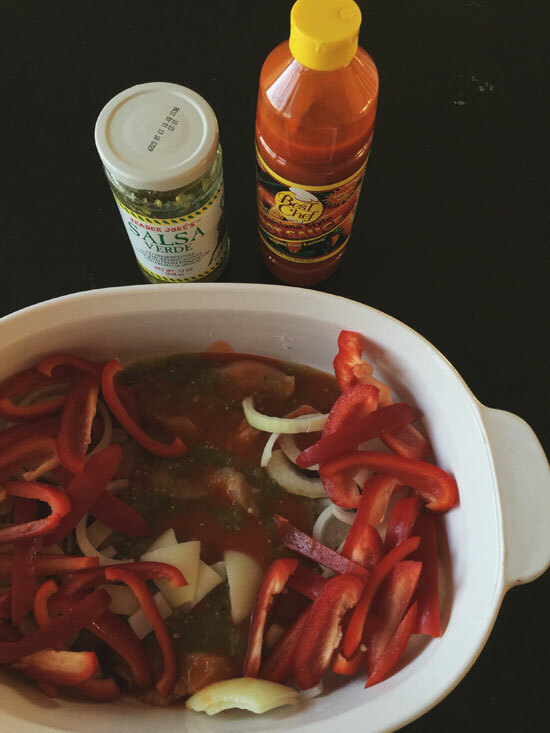 Pour salsa (any kind) over chicken and if you like it spicy, add hot sauce too! 4. Bake for 20-25minutes 5. 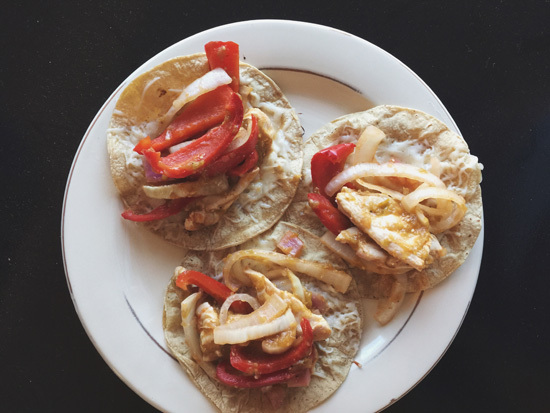 Warm corn tortillas over stovetop the last few minutes that the chicken is cooking. 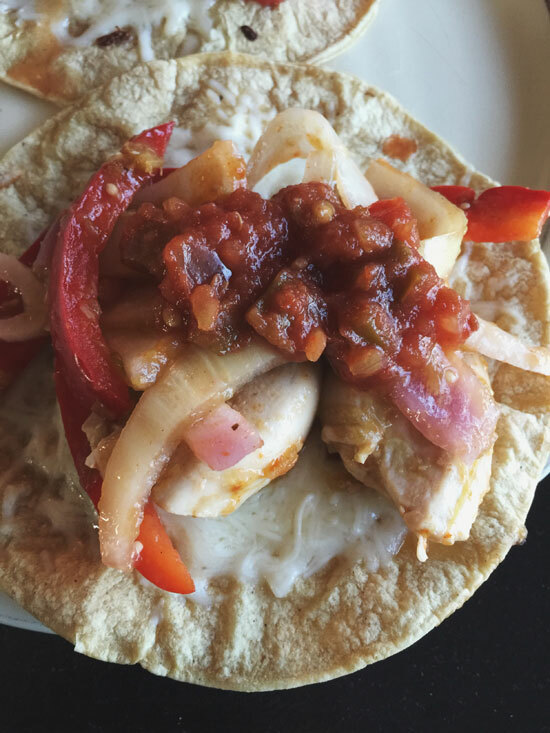 You can also melt a little cheese on the tortillas if you want to! YUM!